Are Pine Plantations in the US South Profitable Investments? Are pine plantations in the US South as financially attractive now as they were in previous decades? This seems like a fairly logical question for forestland owners when one considers long-term regional stumpage price trends. As shown in the chart below, sawtimber price (in nominal terms) has declined since the early 2000s while pulpwood has basically remained level over the same time period. In fact, nominal stumpage prices for all three product categories—pine pulpwood, pine sawtimber and pine chip-n-saw—have been relatively flat since 2008. However, we were able to assemble rotational “example stands” (Stand A and Stand B) by combining some broad and historical information along with an old forester’s recollections. Again, this was not an attempt to nail down all the fine details, but rather to provide a general comparison using the more common elements related to pine plantation management. This exercise covers a period of two rotations and in order to equalize the effects of time, dollar comparisons were adjusted by CPI inflation to give estimates in real dollar terms. For the comparison, we chose to use property with a loblolly pine site index (base age 25) of 60 ft. The table below lists the plantation premises used in the comparison. As shown above, the original Stand A was established in 1957 and was harvested 35 years later in 1992. The following Stand B was established that same year and was harvested 25 years later in 2017. When Stand A was established, genetically-improved seedlings were not yet available and the convention was to plant at fairly tight spacing for two primary reasons: 1) to increase pulpwood availability, and 2) to lower survival rates from competing vegetation since control methods were still being developed and perfected. This stand underwent two thinning treatments, the second of which was followed by a fertilization treatment. By the time Stand B was established, 2nd generation genetically-improved seedlings were available and site preparation and competition control techniques had also been improved. Plantation managers were more confident in plantation survival rates so initial tree spacing was wider with fewer seedlings planted per acre. The following table lists the yield results given these parameters and the relative stumpage prices at harvest age. In terms of total yield, the stands are fairly comparable and even the product divisions are relatively close to each other, except that the sawtimber yield increased in Stand B. As expected, the more recent plantation had a better mean annual increment—about a 50% improvement—however, the product stumpage prices were significantly higher in Stand A. So, how did the two stands compare in discounted financial (real) terms? The results are below. A couple of notes related to the calculations: First, land value was not included. The assumption was that the property was already owned and would continue under the same ownership after harvest. An annual land management expense (property taxes, etc.) was included, as was annual revenue (hunting lease, etc.). In 2017, the annual management expenses were estimated to be around $8.00/acre and the annual revenues were estimated to be around $10.00/acre; both of these figures were discounted back through both rotations according to CPI inflation. The results are also depicted in the chart below. The results show that Stand A had lower expenses and comparable overall revenues when compared to Stand B, but it also grew for 10 years longer than Stand B. The shorter growing time for Stand B—with the associated impact of inflation—more than balanced out the IRR calculation. 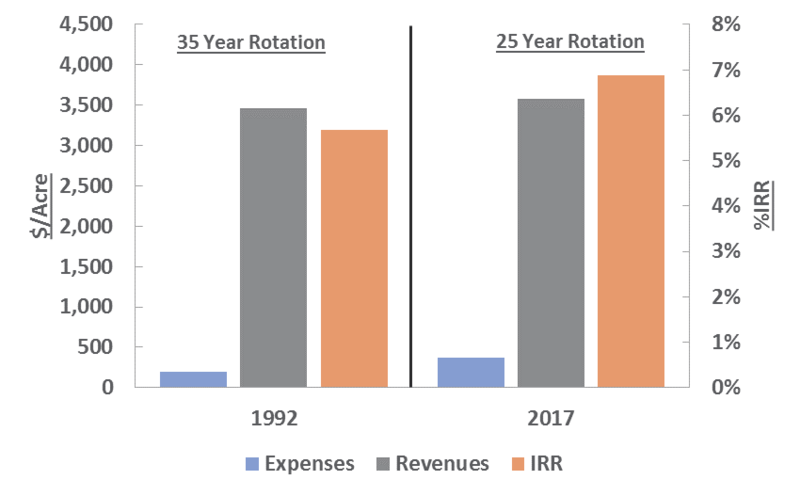 While this example by no means gives an absolute valuation to pine plantation management, it does make the case that current improvements in pine genetics and operational techniques have maintained a level of financial performance despite long-term, downward stumpage price trends.